This article is about the general concept of a meat-eating animal. For the mammal order, see Carnivora. For other uses, see Carnivore (disambiguation). A carnivore /ˈkɑːrnɪvɔːr/, meaning "meat eater" (Latin, caro, genitive carnis, meaning "meat" or "flesh" and vorare meaning "to devour"), is an organism that derives its energy and nutrient requirements from a diet consisting mainly or exclusively of animal tissue, whether through predation or scavenging. Animals that depend solely on animal flesh for their nutrient requirements are called obligate carnivores while those that also consume non-animal food are called facultative carnivores. Omnivores also consume both animal and non-animal food, and, apart from the more general definition, there is no clearly defined ratio of plant to animal material that would distinguish a facultative carnivore from an omnivore. A carnivore at the top of the food chain, not preyed upon by other animals, is termed an apex predator. "Carnivore" also may refer to the mammalian order Carnivora, but this is somewhat misleading: many, but not all, Carnivora are meat eaters, and even fewer are true obligate carnivores (see below). For example, while the Arctic polar bear eats meat exclusively, most species of bears are actually omnivorous, and the giant panda is exclusively herbivorous. There are also many carnivorous species that are not members of Carnivora. 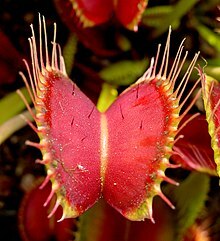 Outside the animal kingdom, there are several genera containing carnivorous plants (predominantly insectivores) and several phyla containing carnivorous fungi (preying mostly on microscopic invertebrates such as nematodes, amoebae and springtails). Carnivores are sometimes characterized by their type of prey. For example, animals that eat mainly insects and similar invertebrates are called insectivores, while those that eat mainly fish are called piscivores. The first tetrapods, or land-dwelling vertebrates, were piscivorous amphibians known as labyrinthodonts. They gave rise to insectivorous vertebrates and, later, to predators of other tetrapods. Carnivores may alternatively be classified according to the percentage of meat in their diet. The diet of a hypercarnivore consists of more than 70% meat, that of a mesocarnivore 30–70%, and that of a hypocarnivore less than 30%, with the balance consisting of non-animal foods such as fruits, other plant material, or fungi. Lions are voracious carnivores; they require more than 7 kilograms of meat daily. A major component of their diet is the meat of large mammals, such as this buffalo. Obligate or "true" carnivores are those whose diet requires nutrients found only in animal flesh. While obligate carnivores might be able to ingest small amounts of plant matter, they lack the necessary physiology required to digest it. In fact, some obligate carnivorous mammals will only ingest vegetation for the sole purpose of its use as an emetic, to self-induce vomiting of the vegetation along with the other food it had ingested that upset its stomach. Obligate carnivores include the axolotl, which consumes mainly worms and larvae in its environment, but if necessary will consume algae, as well as all felids (including the domestic cat) which require a diet of primarily animal flesh and organs. Specifically, cats have high protein requirements and their metabolisms appear unable to synthesize essential nutrients such as retinol, arginine, taurine, and arachidonic acid; thus, in nature, they must consume flesh to supply these nutrients. Characteristics commonly associated with carnivores include strength, speed, and keen senses for hunting, as well as teeth and claws for capturing and tearing prey. However, some carnivores do not hunt and are scavengers, lacking the physical characteristics to bring down prey; in addition, most hunting carnivores will scavenge when the opportunity arises. Carnivores have comparatively short digestive systems, as they are not required to break down the tough cellulose found in plants. Many hunting animals have evolved eyes facing forward, enabling depth perception. This is almost universal among mammalian predators, while most reptile and amphibian predators have eyes facing sideways. Predation (the eating of one living creature by another for nutrition) predates the rise of commonly recognized carnivores by hundreds of millions (perhaps billions) of years. The earliest predators were microbial organisms, which engulfed or grazed on others. Because the fossil record is poor, these first predators could date back anywhere between 1 and over 2.7 Gya (billion years ago). The rise of eukaryotic cells at around 2.7 Gya, the rise of multicellular organisms at about 2 Gya, and the rise of mobile predators (around 600 Mya – 2 Gya, probably around 1 Gya) have all been attributed to early predatory behavior, and many very early remains show evidence of boreholes or other markings attributed to small predator species. Among more familiar species, the first vertebrate carnivores were fish, and then amphibians that moved on to land. Early tetrapods were large amphibious piscivores. Some scientists assert that Dimetrodon "was the first terrestrial vertebrate to develop the curved, serrated teeth that enable a predator to eat prey much larger than itself." While amphibians continued to feed on fish and later insects, reptiles began exploring two new food types: tetrapods (carnivory) and then plants (herbivory). Carnivory was a natural transition from insectivory for medium and large tetrapods, requiring minimal adaptation; in contrast, a complex set of adaptations was necessary for feeding on highly fibrous plant materials. In the Mesozoic, some theropod dinosaurs such as Tyrannosaurus rex were probably obligate carnivores. Though the theropods were the larger carnivores, several carnivorous mammal groups were already present. Most notable are the gobiconodontids, the triconodontid Jugulator, the deltatheroideans and Cimolestes. Many of these, such as Repenomamus, Jugulator and Cimolestes, were among the largest mammals in their faunal assemblages, capable of attacking dinosaurs. In the early-to-mid-Cenozoic, the dominant predator forms were mammals: hyaenodonts, oxyaenids, entelodonts, ptolemaiidans, arctocyonids and mesonychians, representing a great diversity of eutherian carnivores in the northern continents and Africa. In South America, sparassodonts were dominant, while Australia saw the presence of several marsupial predators, such as the dasyuromorphs and thylacoleonids. From the Miocene to the present, the dominant carnivorous mammals have been carnivoramorphs. Most carnivorous mammals, from dogs to Deltatheridium, share several dental adaptations, such as carnassialiforme teeth, long canines and even similar tooth replacement patterns. Most aberrant are thylacoleonids, with a diprodontan dentition completely unlike that of any other mammal; and eutriconodonts like gobioconodontids and Jugulator, with a three-cusp anatomy which nevertheless functioned similarly to carnassials. ^ Nutrient Requirements: Carnivores. Duane E. Ullrey. Encyclopedia of Animal Science. ^ a b Mammals: carnivores. Duane E. Ullrey. Encyclopedia of Animal Science. ^ Mammals"' Omnivores. Duane E. Ullrey. Encyclopedia of Animal Science. ^ Velegrand-Defretin, Veronique (1994). "Differences between cats and dogs: a nutritional view". Proceedings of the Nutrition Society. 53: 15–24. doi:10.1079/pns19940004. ^ Ullrey, D. E. (2004). "Mammals: Carnivores". In Pond, Wilson (ed.). Encyclopedia of Animal Science. CRC Press. p. 591. ISBN 978-0-8247-5496-9. ^ Ullrey, D. E. (2004). "Nutrient Requirements: Carnivores". In Pond, Wilson (ed.). Encyclopedia of Animal Science. CRC Press. p. 670. ISBN 978-0-8247-5496-9. ^ Foley, James A. (February 7, 2014). "Carnivorous, Pre-Dinosaur Predator was First to Evolve Steak Knife-like Teeth". Nature World News. Retrieved May 3, 2014. ^ a b Zofia Kielan-Jaworowska, Richard L. Cifelli, Zhe-Xi Luo (2004). "Chapter 12: Metatherians". Mammals from the Age of Dinosaurs: origins, evolution, and structure. New York: Columbia University Press. pp. 425–262. ISBN 0-231-11918-6. ^ Cifelli, Richard L.; Madsen, Scott K. (1998). "Triconodont mammals from the medial Cretaceous of Utah". Journal of Vertebrate Paleontology 18 (2): 403–411. doi:10.1080/02724634.1998.10011068. ^ Eating Encyclopedia. Animales Carnivoros. Ejemplos, alimentacion y curiosidades. (in Spanish) 02-02-2017. Glen, Alistair & Dickman, Christopher (Eds) 2014, Carnivores of Australia, CSIRO Publishing, Melbourne, ISBN 978-0-643-10310-8.